Note: Winter months include October through March. 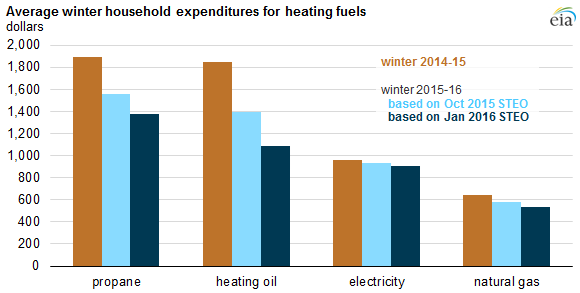 Warmer temperatures and lower energy prices have contributed to a reduction in EIA's current forecast average heating expenditures this winter compared with the forecast in the October 2015 Winter Fuels Outlook. Each October, EIA produces a Winter Fuels Outlook that projects heating fuel expenditures for the coming winter (October through March) based on EIA's forecast of fuel prices and the National Oceanic and Atmospheric Administration's forecast for temperatures (as measured by heating degree days). As discussed in the October 2015 Winter Fuels Outlook, the winter of 2015–16 was expected to have lower expenditures than the winter of 2014–15. In the time since that outlook was released, the weather has been much warmer than expected, and prices have fallen faster than anticipated, resulting in even lower heating expenditures. The warm temperatures compared with last winter have mainly been east of the Rocky Mountains. In the West, temperatures so far this winter are both slightly colder than previously forecasted and colder than last year's relatively warm winter. At the national level, the 2015–16 winter is now expected to be 15% warmer than last winter. 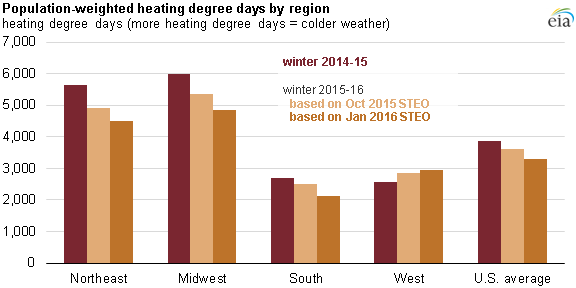 Warmer weather during winter lowers demand for heating fuels, which in turn can lead to lower fuel prices. Natural gas. In the January Short-Term Energy Outlook (STEO), EIA forecast the retail price of natural gas, the most widely used primary spacing heating fuel, to be 6% less this winter than last winter, compared with a forecast of 4% lower in the Winter Fuels Outlook. Based on the most recent price and weather forecasts, EIA expects the average household that heats primarily with natural gas will spend about $110 (17%) less on that fuel this winter compared with last year. Heating oil. Prices for petroleum-based fuel have also been lower than expected because of falling crude oil prices. In the October forecast, retail prices were expected to be 15% lower than last winter, but they are now expected to be 29% lower than last winter. The average household that primarily heats with heating oil is expected to spend about $760 (41%) less on the fuel this winter compared with last year. Propane. Forecast expenditures for propane are also lower than those in the October outlook. 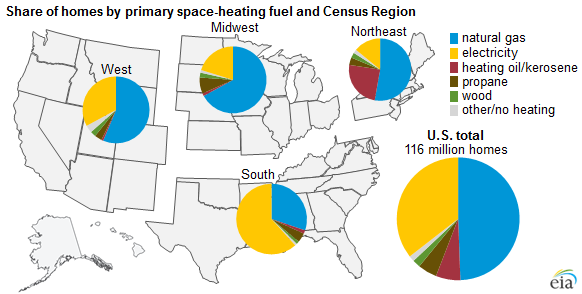 In the January STEO, winter 2015–16 expenditures for households that primarily heat with propane are expected to be 24% lower than last winter in the Northeast and 31% lower in the Midwest. In the October outlook, savings were expected to be 15% and 21% in the Northeast and Midwest, respectively. Electricity. Because electricity prices change much more slowly than the prices of other heating fuels, changes in expenditures over the course of a winter are largely the result of temperature changes. For customers heating with electricity in the Northeast, Midwest, and South, where temperatures have been warmer than expected, winter heating expenditures are forecast to be 9% lower than last year, compared with 5% lower in the October outlook. However, in the West, expenditures this winter are expected to be 9% higher than last year, up from the 4% expected increase in the October outlook.